#1 Lie - Strawman argument: "The Stock Market is Risky"
The way to sell something to someone is to scare them! Advisers who sell annuities love unsophisticated investors who are ignorant of the elementary concept of age-appropriate diversification into bonds. Often they encounter retirees who put a large percentage or even all of their savings into the stock asset class during the 2000's and then these seniors had to go back to work. But it wasn't the stock market's fault. It was the retiree's own fault for taking on way too much risk! The experts generally recommend that at least 50% of your money go into bonds if you're retired. If you only want to do better than annuity-like returns then you would put even more into bonds. From 1970 to 2010 the lowest risk allocation was 72% bonds and 28% stocks. If you have any doubts about the open markets then you really ought to pay a visit to the diversification page. Anyone who took on very low risk with a 67/33 portfolio very predictably coasted through the 2000's "lost decade" no problem! Just look at how insurance companies invest the money that you give them. There is no rocket science to what they do. They do what annuitants should have done... They invest about 70 - 90% in bonds! You can effectively cut out the expensive middlemen (insurance company and Mr. Adviser) by doing what they do with the money! #2 Lie - Apples to oranges: "Look at the high rate of annuity return"
We are all used to seeing the "price return" of the DOW industrial average or the S&P 500 index. For example the S&P 500 index provided an internal rate of return of 21.64% for 2017 including price appreciation and dividends. Or over the last 5 years the S&P has provided a 15.62% annualized return on investment. We invest an amount of money then receive interest payments (or dividend payments) and then when we sell the investment at a final dollar value and get our principal back. Only then can we calculate an annualized return on investment. Annualized return on investment (or internal rate of return) is a standard metric for evaluating the efficiency of an investment versus other investments. ABOVE: With CD's the "return" you see is the annualized return on investment you get. But in the world of annuities "return" takes on a much different form. The word "return" is the most abused word in the insurance industry. For example when Mr. Adviser talks about an index annuity that accumulates at a really high guaranteed rate of "return" of perhaps 7% or more we get excited. It sounds too good to be true -- and in fact it is too good to be true! The high "returning" bucket of money that Mr. Adviser is talking about is not a cash surrender value (like your stock or bond index fund). It's merely an acounting ledger ("roll-up rate") that will be used as a basis for determining an annual interest payment rate. And once you turn on the income spigot of an index annuity, the growth of your money literally stops. That's a bad deal for you and a great deal for the insurance company which continues to invest your money in growing bonds and stocks. Furthermore the interest payments made to you and possibly other fees get subtracted from the death benefit value (inheritance value) until this bucket of money runs down to zero. The annualized return on investment from the point that you annuitize can never be more than ZERO if you live anywhere up to your life expectancy. Beyond that, it might get up around 3% if you live to be 100. #3 Lie - Strawman argument: "Bonds are risky. Just look at GM bonds that lost 99.8% of their value"
The slight of hand is that Mr. Annuity Salesman is talking about individual bonds. You don't invest in individual bonds! You don't put all of your bond eggs in one bond basket. You invest in a bond index fund like Vanguard's total bond market index BND. When stocks fall, money runs to the safety of bonds. Together stocks and bonds can be very low risk if you invest around 28% in ITOT and 72% in BND. #4 Lie - Apples to oranges: "The Bond Bubble"
Bonds will never be as volatile as stocks, even on their worst day. They are slow and consistent, yet some unsophisticated investors somehow believe that bonds might crash like stocks did in 2008. And insurance salesmen are eager to capitalize on investor ignorance. In reality a 1% rise in interest rates in one year's time will only shave between 5 and 6% from a total bond market index fund like AGG. Factor in annual yield and that reduces your loss to only about 2 1/2% to 3 1/2%. How much are the Feds always talking about raising interest rates? 1/4%! It's miniscule. Yet insurance salesmen want to turn this molehill into a mountain in order to sell you that high commission annuity product. Bonds are often likened to brakes on a car. Don't invest without them. They are a time-tested bread and butter part of every portfolio. Always remember the old adage "When stocks fall money runs to the safety of bonds, and vice versa". 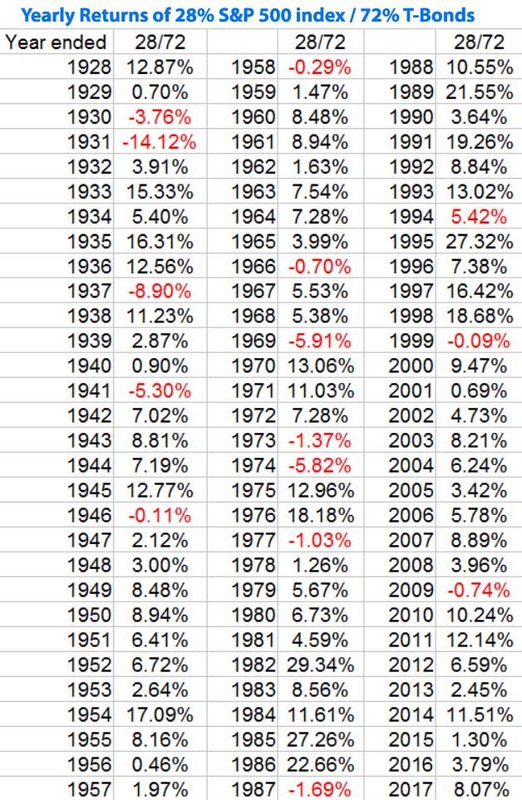 FACT: Since 1928, in 21 out of 24 years in which stocks finished the year in negative territory, 10-year Treasury bonds were up! In 2 of those 3 other years, bonds bounced back big the very next year, thus nullifying the volatility. It is important to note that we are talking about 10-year treasury bonds which are more volatile than a total bond market index fund or the Barclays U.S. 3-7 Year Treasury Bond Index. So when Mr. Annuity Salesman tells you that bonds and stocks are going to crash, tell him to take a long walk off a short pier. Annuities are also long, long, long, long term financial products so it would be a red herring to stress out over bond/stock short-term performance in the first place. Also attempting to time the market with bonds is a fools game. Expectations about the Feds raising interest rates are already priced into the market. By owning bonds you are also able to increase your overall returns by up to 0.35% per year (according to Vanguard) by employing the basic strategy of rebalancing. You cannot rebalance an annuity. Cannot! So if stocks were to crash you would be unable to take advantage of the inevitable stock rebound by shifting more money into stocks, short of paying a contingent deferred sales charge penalty (if that is even an option depending on the type of annuity and terms) plus tax penalties. Even with everyone expecting interest rates to rise you wouldn't want to abandon bonds. Experts are saying to simply avoid the more interest rate sensitive long-term bonds (of more than 10-years). Actually a buy and hold index investor can simply continue to hold their total bond market bond index fund, which has less volatility than the Barclays U.S. 7-10 Year Treasury Bond Index. BND has an average duration of only 5.7 years. Furthermore, what's bad for the goose is bad for the gander. 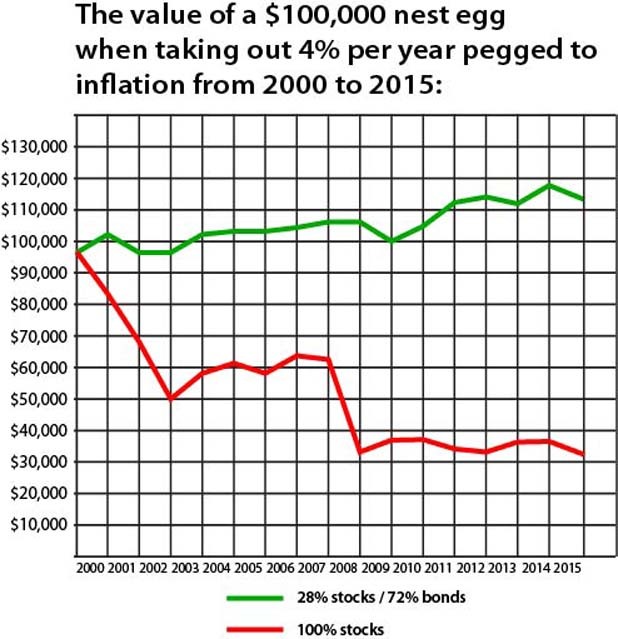 Insurance companies invest 70% - 94% in bonds! So if you somehow believe that bonds are going to crash then you should be worried that insurance companies will be dropping like flies and your state's guarantee fund will become depleted. Once that happens, annuity guarantees are not guaranteed. Annuitants in California will automatically lose at least 20% of their money. #5 Lie - Strawman argument: "Picking stocks and bonds is too complicated for the average investor"
You don't invest in individual stocks and bonds! You invest in index funds. Investing in index funds couldn't be simpler. You can own a total bond market index fund like BND and a total stock market index fund or S&P 500 index fund like SPY. Maintain your predetermined allocation ratio by recentage rebalancing if and when it becomes imbalanced. #6 Lie - Eliminate the competition: "Annuities are not meant to be compared to investments like stocks and bonds"
This is Mr. Adviser's sneaky way of attempting to eliminate the competition. It's like saying JaMarcus Russell should never be compared to good quarterbacks. How convenient! Annuities are classified as "insurance products". So what!!! Annuities are a place where people put their money go to to work to produce returns -- Just like stock and bond index funds or any other investment! Given the level of risk that that is appropriate (usually low), retirees want the best return for their money -- not the worst returns! #7 lie - Shell game: "This annuity has no fees and you don't pay me any commission"
Annuities are some of the most expensive of all financial products. Fees are just one of the many ways they get your money. If there aren't fees then you're going to indirectly pay dearly through things like lower performance caps, lower participation rates, lower payment calculations, surrender penalties, etc. When someone buys an annuity this typically results in a wealth transfer of as much as 15% to 20% from the annuitant to the insurance companies and sales agents who sell them. #8 lie - Strawman argument: "A broker will cost you just as much as a commission-based adviser like me"
This is the classic false choice. Both are terrible choices. The best and only choice should be 1) do it yourself (it's easy) or 2) hire a fee-only fiduciary adviser on a one-time or one-task basis. And don't hire a full-time "asset manager" who will charge you a percentage year after year either. And definitely don't go to a commission-based "adviser" who does not legally work for you and your best interests! #9 lie - Dummy it down: "All I'm doing is trying to earn a living by selling annuities"
The problem is that you are selling crap financial products. And in this world we as investors have choices. We don't have to be fleeced by you. #10 lie -- Invoke authority: "I'm a fiduciary, therefore I have no conflicts of interest"
Merely being a "fiduciary" is not good enough. Fee-based fiduciaries are allowed to earn back-door sales commissions when they sell certain products such as annuities. This is a conflict of interest. As long as they are allowed to earn back door commissions you can never be certain if that fee-based fiduciary is making investment recommendations in his best interests or in your best (client) interests. Also some advisers are dually licensed, meaning they are licensed to act either as a fiduciary or a commission-based salesman. And if you don't ask for the right signed paperwork, memorializing their fee-only fiduciary duty each year, he will most likely decide for you by acting in the capacity of a commission-based salesman or fee-based salesman. Accordingly, always work with the fee-only variety and on a one-time or one-task basis. Get them to memorialize this in writing. A legitimate adviser will provide you with both parts of what's called a "Form ADV", and provide you with a written disclosure of exactly how he will / may be compensated for his services and list any potential conflicts of interest. They should also do so on an annual basis if you continue to seek out their help. #11 lie -- Invoke authority: "I'm a certified financial planner"
The truth is that insurance agents usually don't call themselves "insurance salesmen". The first step in gaining someone's trust is to flash certifications that sound trustworthy such as CFP (Certified Financial Planner), CRPC (Chartered Retirement Planning Counselor), CLU (Chartered Life Underwriter), ChFC (Chartered Financial Consultant), Chartered retirement planning counselor, RICP (Retirement Income Certified Professional), CEBS (Certified Employee Benefit Specialist), CEA (Certified Estate Advisor), etc. Certifications are fine and dandy but they say nothing about whether you are dealing with someone who legally works for you and your best interests, with no conflicts of interest. Unfortunately most investors get fooled by certifications into thinking that the adviser can also can be trusted for unbiased advice. In fact 3 out of 4 investors mistakenly think that financial advisers at brokerage firms are required to put clients’ interests first. #12 lie -- Slight of hand and a strawman argument: "Annuities are guaranteed! Stocks and bonds are not!" First of all, annuity guarantees are actually not guaranteed. Those guarantees are only backed by the one single insurance company that makes them. Sometimes insurance companies become insolvent (bankrupt). Each state has a guarantee fund but that fund might become tapped out in the event of an industry wide systemic failure. Adding insult to injury, some states like California only guarantee 80% of your so-called guaranteed money. This insolvency risk is a problem that is unique only to annuities. Stock and bond index funds don't have this problem of risk of insolvency in the first place. The value you see is the value you get. Annuity salesmen will then correct themselves by saying that they're really talking about traditional investments not being guaranteed against market downturns. But again this takes us right back to the subject of how diversification protects you. When you study the historical returns of bonds and stocks together in a low risk portfolio, these annuity guarantees against "loss of principal" are unnecessary even when back testing the great depression. We can make reasonable projections based on trend lines from 90 years of stock / bond performance data. A bond-heavy mix of index funds isn't casino gambling. There have been years in which a low risk 28/72 portfolio has lost money, but never over longer time periods (like those of annuity contracts that we are comparing traditional investing to). Therefore it is deception to bastardize traditional investments by saying that stocks and bonds are not "guaranteed" and then citing short time periods of one or two years. An old adage comes to mind: "Never bear too much risk or bear too little risk". With an annuity you are bearing way too little risk in exchange for easily beaten 1% - 3% returns. According to the Irrelevant Investor, if you want to suppress volatility it’s likely you’ll suppress your returns as well, it’s just that simple. If you're too afraid to take any risk then you're going to get a lowly 1% - 3% annuity-like internal rate of return. 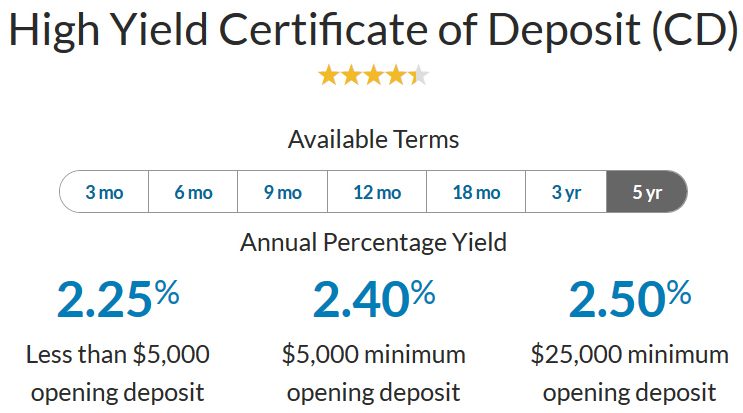 Furthermore the same flawed insurance salesman argument could be applied to certificates of deposit. You could declare that CD's are guaranteed (by the FDIC) and bonds and stocks are not. But this certainly doesn't mean that investors should dump their bonds and stocks in favor of CD's. Or you could declare there are no guarantees that your house won't be destroyed by a meteorite, therefore you need insurance against acts of God that are not covered by regular insurance policies. But you have to analyze risk. Some risks need to be controlled. Some risks are not worth paying to insure against. Again study the historical returns of bonds and stocks together in a low risk portfolio. #13 lie -- Catch 22: "Annuity guarantees are backed by a guarantee fund"
The mere fact that annuities need a guarantee fund is a handicap -- not something to brag about. Stock and bond index funds don't have this problem of risk of default in the first place! The value of your stock and bond index fund shares that you see quoted on the NYSE is what you get. Furthermore insurance companies are the ones who have to put money into this fund. Guess who they pass off these costs to? You the annuitant. It's an added layer of costs. #14 lie -- Shell game: "Deferred taxes!" This is a case of not telling the whole story. It is not what you make but rather what you get to keep (after Uncle Sam has his say). Annuities are in fact taxed at a higher rate than normal investments like stock and bond index funds. In a Wealth Manager article called "Photo Finish" this idea of annuities being a "tax advantage" was soundly debunked. In reality annuities are a tax disadvantage, costing you more money in the end. Annuities are a tax nightmare in many other ways too (LIFO, limited write-off ability, etc). #15 lie -- Association fallacy: "Annuities are an asset class"
So what!!!! So are loans, futures, options, promissory notes, etc. Just because they are classified as their own "asset class" doesn't mean that they are good investments or a so-called bread and butter part of everyone's portfolio. It's an attempt by Mr. Adviser to dummy it down and make you feel warm and fuzzy about annuities. #16 lie -- Eliminate the competition: "Annuities are not investments"
Annuities are classified by regulatory authorities are "insurance products". But this is irrelevant as far as consumers are concerned when comparing options. Annuities are a place where people put their money to go to work and people want the best return for the level of risk that they want to take. With an annuities you are committing the Cardinal sin of bearing way too little risk and in turn getting too little returns. So to say that "annuities are not investments" is nothing more than an attempt by Mr. Commission-based "advisor" to lower your expectations regarding the annuity that he wants to sell you. #17 lie - Manufactured rule: "The guaranteed part of your portfolio"
The arbitrary notion that a certain portion of your portfolio is supposed to be guaranteed is a phoney rule conjured up by commission-hungry insurance salesmen. It's like saying every football team needs a few really bad players. #18 lie - Argumentum ad populum: "Nearly every financial planner recommends that you put at least a portion of your retirement savings into an annuity"
Follow the money and the money will always lead you to the motives of adivsors. Nearly every financial adviser is a commission-based adviser. 85% of advisers are non-fiduciaries (they are just salesmen). Of the remaining that are fiduciaries, many of them are merely fee-based advisers, meaning that they are still allowed to earn back-door commissions by selling products like annuities. #19 lie -- Strawman argument: "Do you want maybe income or guaranteed income?" This is continued stock market fear mongering for investors who are ignorant of the historical performance of low-risk bond / stock portfolios. When you diversify heavily into bonds you smooth out stock market volatility. In reality annuities are not guaranteed if the one single insurance company that writes the annuity contract becomes insolvent, and the state guarantee fund becomes tapped. While annuity income may be guaranteed not to run down to zero, it is very likely not going to be sufficient later in life due to inflation. In reality if you take on too little risk you stand a great chance of falling short on income if you live long enough. Therefore "maybe income" is a good thing. We can turn the tables on annuities and say "Do you want loss of liquidity or even total loss of your original principal OR do you want the guaranteed liquidity that you get with stock and bond index funds?" #20 lie -- Manufactured rule: "Annuities are not for everyone, however they are great for some"
A great way to gain someone's trust is to style yourself as a "critic" of the very products you are trying to sell them. Annuity salesmen are famous for this. They make you think that they have restraint and lines that they won't cross even though there is a massive conflict of interest in recommending an annuity to you due to obscene back-door commissions. What matters most is not a sweeping conclusion from a salesman but rather an unbiased analysis of the product itself versus other alternatives such as stock and bond index funds. The principals of mathematics are the same for everyone. To say that earning paltry returns is "great for some" is just plain nonsense. Ric Edelman has said that he has only sold about 10 annuities to some 16,000 clients. Would you describe 10 out of 16,000 as "not for everyone" or EXTREMELY RARE? The rare good fit for an annuity is usually someone who is vulnerable to lawsuits and they live in a state like Florida which shields retirement accounts from judgments, however simply increasing one's insurance policy is usually sufficient, making no need for an annuity. #21 lie -- Manufactured Rule: "The key to retirement is balancing risk and guarantees"
This is a sweeping conclusion invented by insurance salesmen. It's an attempt to sell you insurance products. The key to retirement is balancing risk and getting the best return for your desired level of risk. With insurance products you are bearing too little risk and predictably getting too little returns. The rest of the story... This is the chart that insurance agents don't want you to see -- How index annuities were easily beaten even during the 2000's recession. #23 lie -- Shell game: "You get a 10% up front bonus!" If you surrender that annuity within 10 years you will not only forfeit all of that 10% bonus, but you will also pay a surrender charge! 10 years is plenty of time for the insurance company to come out the winner and you the loser. And you will have to pay the higher ordinary income tax rate on actual gains. #24 lie -- Shell game: "This annuity has no caps!" Yes it has no performance cap but it also has a participation rate that achieves a similar effect of having a performance cap, and the annuity still has a surrender fee and you will have to pay the higher ordinary income tax rate on actual gains. You will lose no matter what. #25 lie -- Shell game: "A SPIA or other income annuity is not used for return on investment. It is used to ensure cash flow, which is the number one concern in retirement." Insurance salesman use this argument when confronted by astute investors who understand that a SPIA can only be expected to provide a very low return on investment of between zero and 3% over a lifetime. Yes you get a higher annual payment rate initially, but what he isn't telling you is that eventually you will be living in poverty due to those fixed annuity payments that don't keep pace with inflation. An annuity does not insure adequate cash flow at all. The time tested way to insure adequate cash flow is to take out 4% per year. And finally, return on investment matters! If you have heirs or a charity that would benefit from your nest egg then the more the better. Even if you have nobody in mind to give your money to when you die, do you really want some insurance salesman and the company he works for to take you to the cleaners? #26 lie - Slight of hand: "Income for life that you cannot outlive!" The catch is that these income payments are not adequate income payments! For example, I can promise to pay you a penny per year and be truthful in saying that I will give you "fixed income payments for life". An immediate annuity pays what is initially a high income payment that is above the normal 4% withdrawal rate. The problem is that inflation will dwarf those fixed payments until they become inadequate. #27 lie -- Invented special skill: "I specialize in wealth preservation". This is code for "I'm a commission-hungry insurance salesman who will try to sell you illiquid, expensive annuities and / or expensive cash value life insurance products". There is no special skill set that an adviser learns in order to help a senior citizen invest versus a younger person. The approach is the same for all investors: Determine what level of risk is appropriate for the investor, invest in index funds and then rebalance as needed. One's appetite for risk is essentially reflected in stock/bond allocation ratio. For anyone to say that they specifically specialize in helping investors who have less risk is a worthless sales gimmick designed to gain the trust of senior citizens or anyone who is ignorant of diversification. If you need help, the qualification that matters is whether an adviser is a fee-only fiduciary who works on a one-time basis. There are also "light-advice" companies such as Vanguard, Fidelity and Charles Schwab who charge much smaller asset management fees. #28 lie - Apples to oranges: "Zero is your hero"
Insurance salesmen use this catch phrase when comparing apples to oranges. They deceptively compare their index annuity to 100% stocks during bear market years such as 2008 when stocks alone dropped 37%. What they aren't telling you is that with a low-risk 28/72 portfolio you were up 3.96% in 2008. So is zero really your hero? No! And in fact index annuities are unlikely to provide better returns than bonds. #29 lie - Ignore existing solution: "An annuity solves the problem of income during retirement"
This statement implies that generating income with a traditional low-risk portfolio of stock and bond index funds is somehow unsolved, which is nonsense. In fact a low-risk portfolio of bonds and stocks will appreciate more in value than an annuity. It may not pay as much in dividends, but if you need more yearly / monthly income you can simply sell off a portio of your principal that has been growing and compounding. #30 lie - Muddy the waters: "There's a lot of misconceptions about annuities"
This statement is nothing more than an attempt to discredit the endless truthful criticism about annuities. Maybe Mr. Annuity Salesman can convince you that all of the dirt you've heard about annuities was false. Or maybe you'll conclude that there's a "middle ground" between what the critics and salesmen are telling you. #31 lie - Strawman argument: "Variable annuities are absurdly expensive. That's why we recommend index annuities"
This is a combination strawman argument and shell game. They picked one of the most expensive financial products on earth to hopefully make index annuities look good. 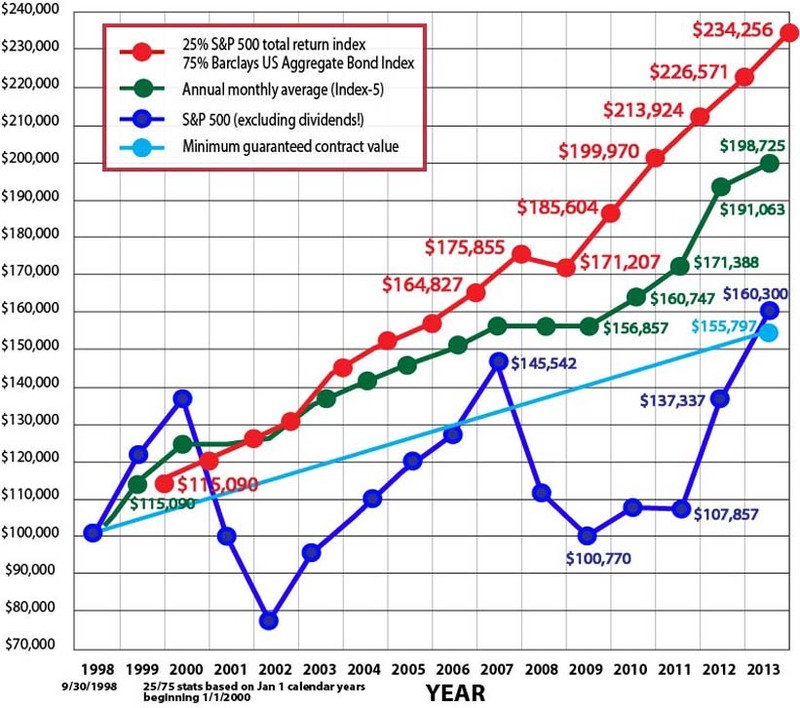 Why didn't they compare index annuities to index funds which has fees as low as 0.05% per year? Or at the very least why didn't they look at a non-retail variable annuity like Vanguard, which has drastically lower fees than retail variable annuities. Answer: Strawman presentation. And the truth is that while index annuities don't have "management fees" they simply use other methods (caps, participation rates, rider fees, etc) to essentially make them also one of the most expensive financial products on earth. You just don't know it because it's a shell game. #32 lie -- Strawman argument: "The average insurance salesman only makes $47,860 per year. We are not laughing all the way to the bank." It makes no difference from the standpoint of the investor. 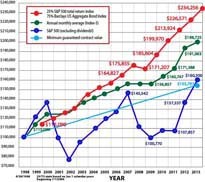 Whatever the dollar amount of your salary doesn't change the fact that 1) insurance products are crap financial products, 2) those crap financial products pay lavish commissions when compared to other financial products such as superior, liquid, low cost index funds which pay zero commissions to sales agents. If anything, that modest salary is proof that there is even more incentive to aggressively sell annuities and cash value insurance products. Insurance salesmen are barely scraping by and so they are desperate to make the next sale. #33 lie -- Strawman: "Your broker doesn't want you to know about annuities." This is an attempt by Mr. Annuity Salesman to trick you into thinking that he has your best interests at heart and other advisors don't. He doesn't have your best interests are heart. Brokers don't either. Not all brokers are licensed insurance salesmen. They simply sell other crap products like non-traded REITS, expensive actively managed mutual funds, etc. Only fee-only fiduciaries can be trusted on a one-time or one-task basis. Fee-only fiduciary advisers do not recommend annuities because they legally work in the best interests of their clients and do not earn back door commissions. They will never recommend crap financial products like annuities. #34 lie -- Turn molehills into mountains: "Some people claim that annuities are illiquid. This is not true!!! With most annuities you can take out 10% per year during the surrender charge period." To be precise, most annuity contracts are 90% illiquid during the surrender charge period. It's comical for anyone to boast about you having access to only 10% of your money. Index funds can be sold in part or in full at any time for any reason and without penalty. There is simply no comparison. #35 lie -- False sense of secuirty: "The new Fiduciary Law protects you by eliminating conflict of interest"
This new rule does not go into effect until April 10, 2017 (if it is not blocked by lobbyists) and for starters it only applies to retirement accounts -- not money held outside of retirement accounts. Secondly the new law does not prohibit the sale of annuities. It simply raises the regulatory bar for annuity sales. Accordingly don't expect advisers to stop selling these crap financial products known as index annuities. They will figure out creative ways to continue to sell them. Furthermore, as discussed earlier, "fiduciary" is only good if you work with a fee-only adviser. Advisers will simply get more creative by asking leading questions in their quest to sell you high commission products. #36 lie -- Hear, see and speak no evil: "It's not about the size of your funds. It's about the size of your income." This is a three-fold ignoring of 1) the fact that lack of liquidity is a bad thing, and 2) those initially high "distribution phase" income payments eventually become dwarfed due to inflation, and 3) that income base that you were building during the "accumulation phase" was either plagued by inferior returns or it is merely an "income base" ledger which must be annuitized. #37 lie -- Asking leading questions: "Are you interested more in the return of your money rather than the return on your money?" Beware that even fee-based fiduciary advisers may use leading questions like this for the true purpose of protecting their own butts from breaching their fiduciary duty. It's very easy for investors to answer yes to this question without understanding the implications of accepting that higher-than-4% income that annuities pay. Annuities such as index annuities and immediate annuities pay a really really low annualized return on investment. Annuities such as immediate annuities and index annuities (once annuitized) typically pay a high rate of annual interest payments. The problem is that those high payments stay fixed for life. Inflation will eventually dwarf those fixed payments. It has been said that dumping money into a SPIA is like deciding that taking a vacation at age 65 is more important than having food and shelter at age 85. Therefore a truthful way to pose this question would be "Are you interested more in the initial income rate of your money rather than the income rate later in life as well as like getting zero or a very low return on investment?" #38 lie - Stupid anecdote: "An annuity is nothing more than a tool in the tool box"
Annuity is like that 99 cent screwdriver that chips apart in short order. Calling an annuity a "tool" is nothing more than an attempt to make you feel warm and fuzzy about annuities. Insurance salesmen are tools. #39 lie - Anecdote: "Ben Bernanke owns a fixed annuity and a variable annuity, therefore annuities must be a good place to put your money"
This doesn't change the fact that annuities are inferior financial products. Ben Bernanke has never commented on why he put money into these annuities and whether he regrets it. Some of the seemingly brightest minds have made colossal financial blunders. Jeffrey Katzenberg, Steven Spielberg, Eliot Spitzer, and Kevin Bacon were all Bernie Madoff victims. Florida governor Jeb Bush was a consultant to Claudio Osorio while Osorio was running a 50 million dollar fraud scheme. Congressman Dana Rohrabacher gave support to Joseph Medawar's fraud scheme. #40 lie - Shell game: "This index annuity grows at 7% per year for 10 years." This is not a 7% annualized return on investment. You cannot cash out after 10 years. After 10 years you will no longer continue to get that 7% growth. After 10 years you must annuitize the contract, during which time you get ZERO growth. That means that you must start receiving fixed income payments for life based on just that short 10 years of growth of that money. When it's all said and done you will not get anywhere near a 7% annualized return on investment regardless of how long you live. #41 lie - Strawman argument: "Transfer longevity risk"
Translation: Transfer of wealth to an insurance company and guaranteed longevity poverty. And again, you mitigate risk by diversifying into bonds. #42 lie - Simply false: "If you're fortunate enough to live to age 100, with an annuity you've really made out"
Again, you are left in poverty. Those initially high income payments have becomed dwarfed by inflation. By age 100 a low-risk bond/stock index fund mix is probably paying more than double what any annuity is paying and you should have principal left over for your heirs. #43 lie - Misdirection: "With SPIA's 100% of unused money goes to your beneficiaries"
What insurance salesmen aren't telling you is that there is ZERO growth of your money. That's a terrible deal! Beneficiaries get zero return on investment no matter how long you live. Since your money stops growing, once you live to your life expectancy there is typically NO money left for beneficiaries. #44 lie - Ad hominem: Marginalize the critics as being "angry, haters, trolls, uneducated, intellectually lazy, uncivil, as people who are spreading politically correct financial hate speech, making hate generalities, drinking the annuity hate Kool-Aid, and have an agenda." It's hard to find the truthful reviews about about annuities because the Internet is so cluttered with forum posts, websites, videos and articles coming from armies of insurance salesmen saying happy things about annuities. If you do happen to stumble upon the truthful reviews and articles, as a last resort, insurance salesmen may try to marginalize the messengers of truth. Eventually naive investors may get confused and at least find a halfway ground. Insurance salesmen hope to convince you to put at least some of your money into annuities. Here's a prime example of insurance saleman propaganda. #45 lie - "I'm only recommending that people put some of their money in annuities"
This statement is inherently defensive. It is an implied admission that annuities are inferior. Not putting all of your money in annuities is less damaging. #46 lie - Slight of hand: "In retirement it's all about income -- not return on investment. That's what annuities do." But greater return on investment is greater income! Just because your stock and bond index funds don't pay enough in dividends and interest doesn't mean that's all you get! You simply sell off a portion of your principal that has been growing. And again, annuities do not give you adequate income later in life. And return on investment matters to heirs. #47 lie - Strawman argument: "A lot of people don't have the time and motivation to learn how to invest"
When insurance salesmen say this, they are assuming that someone must invest in individual stocks and bonds. Nobody should do that! They should instead invest in as few as 2 index funds then percentage rebalance as needed. Investing in index funds so easy a 5th grader can do it! In reality it's annuity products that are extremely complicated. People don't have the time and resources to even begin to learn how these products work let alone how they will perform over time. If someone can't figure out the simplicities of investing in index funds then they should simply hire a fee-only fiduciary for a one hour consultation. #48 lie - Scare tactics: "Future returns of stock and bonds are not guaranteed"
So what! 90 years of stock / bonds return data gives us trend lines by which we can make reasonable forecasts. Furthermore when someone buys a house this is usually the largest investment they will ever make. They don't think twice about not having a "downside guarantee". The guarantee is the track record of the neighborhood they buy into and the long length of time they plan on living there. #49 lie - Strawman argument: "There is no guarantee that bonds and stocks are uncorrelated assets. They can both go down simultaneously, and sometimes do." Annuities are long-term financial products -- not short-term products. Therefore it is a deception to cherry pick and use a one or two year down period of bond and stock performance as justification to avoid traditional bond / stock investing. #50 lie - "Annuities have evolved"
This is Mr. Insurance Salesman's attempt to quash the negative talk about annuities that you may have heard. He tries to suggest that unlike annuities of the past, today's annuities somehow pay better returns. The truth is that no insurance company ever decided to start playing Santa Claus. Nothing has changed. Annuities may have more moving parts, and that confuses people, but the internal rates of return have stayed the same. For example index annuities were and still are producing CD-like internal rates of return. If they paid out more then insurance companies would go out of business. #51 lie - Create confusion: "Everyone has their opinions on annuities"
This is an attempt by Mr. Insurance salesman to cause consumers to think that there is a "middle ground" between what the consumer advocates are saying about annuities and what the salesmen are saying. Maybe you'll meet halfway by putting "some" money into the annuity that he's trying to sell you. This statement is also an ignoring of the fact that data which demonstrates that annuities are inferior has nothing to do with opinion. #52 lie - Invoke authority: "You're not a licensed insurance agent therefore nobody should listen to you"
Anyone can present data. Data speaks for itself. Insurance salesmen making statements of opinion cannot be trusted because they are biased. They sell annuities for lavish commissions. #53 lie - False implication: "Only 21% of Americans feel confident about having enough money for a comfortable retirement"
This statement implies that an annuity can correct a problem. It can't. If you don't have enough money then you don't have enough money.